Happy Friday! I hope you all had a great week and are having a ghoulish Halloween! If you are on Pinterest or Facebook, today’s Show and Tell is for you! I have some info on Facebook and Pinterest settings that could make your news feeds include more of what you want to see. 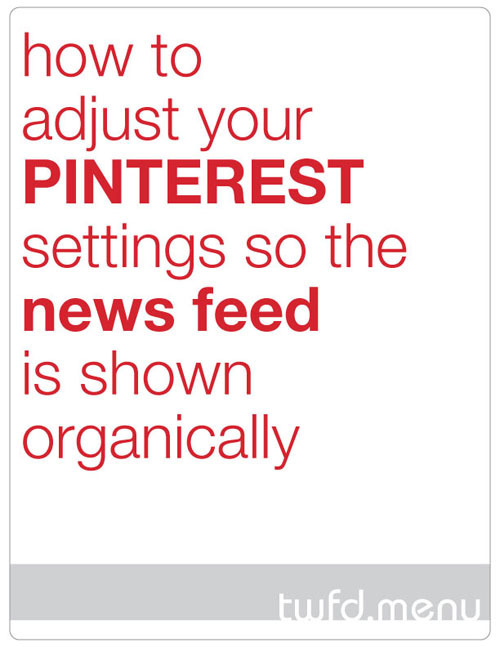 Pinterest: Recently Pinterest changed the way you see the pins on your home page. Previously your Pinterest home page was chronological, so you would simply see the most recent pins from all of the boards that you follow. Pinterest recently adjusted this so your pin news feed is based on web cookies and your browser history. Essentially Pinterest’s smart algorithms are now curating your feed, pushing pins to the top that they think you will be most interested in as well as featuring sponsored pins more heavily. If you’re fine with this, then you’re all set! But if you’d like to get your feed back to the way it was before, you can do so. Here’s how! Go to your profile page on Pinterest. Under the first section “Account Basics” you will see a small section called “Personalization.” Switch both buttons in that section to “No.” Your feed should revert to the original stream. 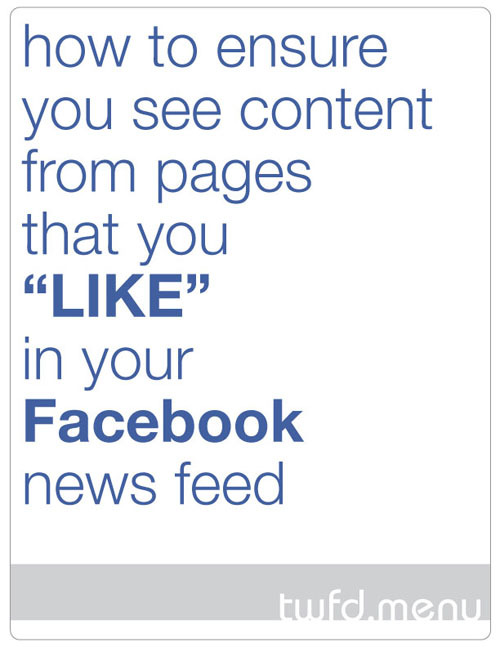 Seeing Content from Facebook Pages You Like: Did you know that just because you “Like” a page on Facebook doesn’t mean content from that page will actually show up in your feed? In fact, it most likely will not. As I talk with friends I’m learning that Facebook users who do not manage pages have no idea this is the case. (People who do manage pages are very well aware – any given item I post on my Facebook page may only be seen by as few as 100 people and rarely tops 3,000, which does not match up to the nearly 18,000 likes I have on my page.) SOOOOO…if you “Like” a page and actually DO want content from that page showing up in your news feed, here’s what you need to do! Visit the page that you like. If you haven’t already, “Like” the page. The little box that says “Liked” has a drop down menu – click on that then select “Get Notifications.” Now that page’s content will appear in your feed. When I started this blog nearly 8 years ago, I was constantly sharing my favorite Trader Joe’s finds, much to the chagrin of those readers who didn’t have a Trader Joe’s near their home. I backed off a lot over the years, but I recently found an item that I am loving and have to tell you about. If you don’t have a TJs, my apologies. 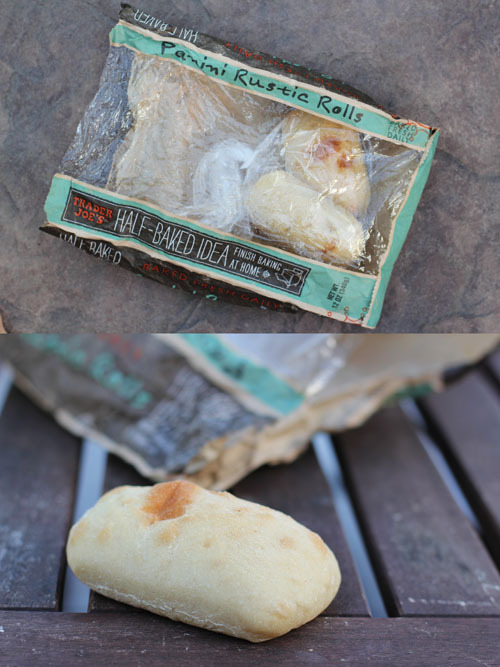 The Half-Baked Panini Rustic Rolls are AWESOME. We’ve used the rolls for pesto chicken salad sandwiches and for a variation on our caprese paninis. The bread is perfect for sandwiches, with a nice crisp exterior and chewy interior. The big bonus is that, magically, the sandwich fixings don’t squeeze out as you eat the sandwich. We LOVE this bread! That’s all from me today…what do you have to share? Friday Show and Tell: The Cutest Comment on the Internet, A Must-Read Article About Plastic and More! Happy Friday! I didn’t publish any blog posts this week – that might be the first time ever! It was the last week of summer and we are dealing with a plumbing mystery that has taken hours (days?) of our time and is resulting in the need to repipe our house. Yes, totally sucky. But, I have a house to repipe, so who am I to complain? As a result of my non-posting this week, I’m bubbling over with things to share with you, so today’s Show and Tell is chock full of good stuff! 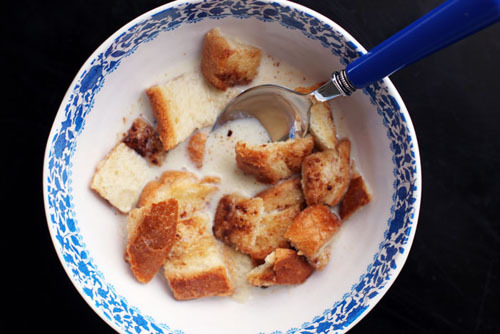 I had a post publish on Babble this week entitled Kick It Old-School with this Milk Toast Breakfast Recipe. I’ve been excited for this post to go live so I could share it with you. The recipe is seriously delicious. As wonderful as the recipe is, I have a little something else about milk toast that I have to tell you about. Milk toast is considered a “vintage” recipe, one that I’ve found many people haven’t even heard of. While I was researching milk toast for my article, I came across a comment on a random website by a reader named “Grumpy” that absolutely captured my heart. “I have tried to make [milk toast] from memories of my mother making it when we were children. We had more milk than we could use from the cow I milked, and fresh home churned butter mixed into the hot milk. Mine is not near as good as I remember it was back then. I am 85 and have to cook now, after all these years. I do miss my darling wife’s cooking.” Seriously, this might win best comment on the internet ever. I can’t even. 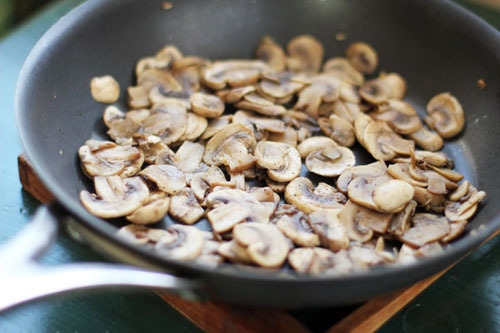 Here are my other food links for the week! Phew! I’m done! Your turn to share whatever you like! Also, if you’ve joined me on the Use Less Plastic train, tell us how it’s going! Before I get to food links, I have two things to share with you that I’m loving. First off, I started wearing Birks. 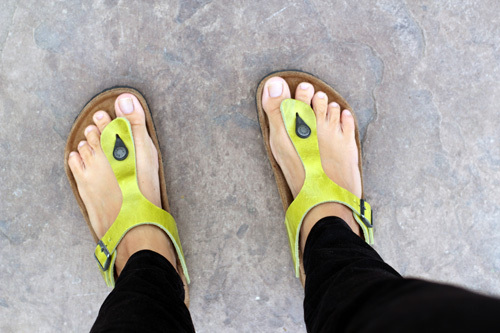 As in Birkenstocks, specifically the Gizeh sandals. I received them as a gift last fall at a Ladies’ Home Journal event but didn’t start wearing them, despite my sister-in-law Hannah who works in fashion in NYC telling me that people were totally wearing them again. Then I bought a standing desk and my feet started hurting from standing so much and then I pulled out the fancy new Birks and THEN I FELL IN LOVE. Just thought I should let you know. My feet never hurt when I wear these. Plus, they’re actually kinda cute. 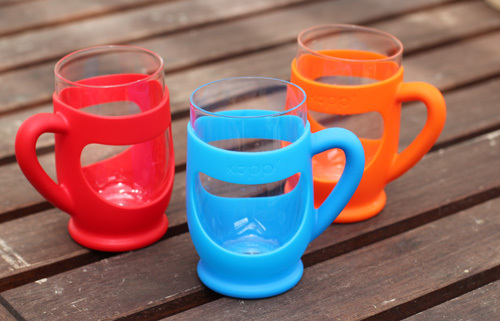 Second, a new company started by a mom contacted me about trying out their product, the Kupp’. My kids are absolutely loving it! I love that they are made out of glass, given my goal to phase out plastic as much as possible from our lives, but the silicone sleeve makes them very kid-friendly. And my kids love having their very own cup to be responsible for. They basically haven’t used anything else for two weeks! As always, please share anything you like! Happy Friday! I survived our first full week of summer at home. Yay! My strategy is to work a bit each day and then plan one fun thing to go out and do with the kids each day (even if it’s just a stop at the library or sprinklers in the yard). One of our fun activities this week was watching Honey, I Shrunk the Kids. I can’t even tell you how excited I was when it came onto Netflix service recently. The kids totally loved it! I especially love how nervous Cate would get during the suspenseful scenes, it was crazy cute. Also, I can’t believe how much of that movie I still have memorized. Kinda scary. Here are links to all my other stuff on the web this week! Your turn to share whatever you want! Blog posts, fantastic finds, summer activity ideas, it’s all fair game! Friday Show and Tell + Fondue with Kids! Happy Friday! Just a few fun links today and then I’ll be out of your hair! 😉 As always, please share your own stuff in the comments, too! I love seeing what you’re up to/what caught your eye during the week/all of it! 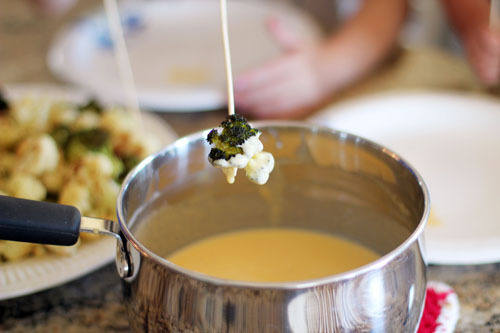 Okay, so I really loved writing my Babble post about making fondue with kids this week. We put it all together with our extended family here in New Jersey and had a blast! The cooking was fun, the eating was fun and everything tasted wonderful. Plus, there are lots of cute photos and two great recipes in the post. So, you know, be sure to check it all out! 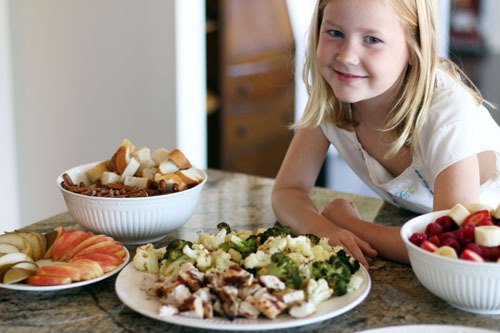 3 Kids, a Mom & a Kitchen: Fun with Fondue! And here are some fun posts on Cosmo this week! Happy Friday! 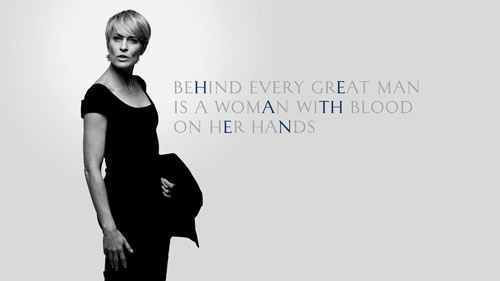 Let’s start with an inspirational quote, shall we? A BIG congratulations to my amazing sister-in-law Hannah who just launched her own company, Odessa Swimwear! Until June 15, you can get 20% of your order and free shipping if you enter the code 2042JUNE. If you’re looking for a high-end bikini made from beautiful fabrics, Odessa is just what you need! Two quick shout outs before I get to this week’s food links. My chair finally arrived from Dot & Bo and it is perfect. I am so happy we were able to buy it! On a related note, Dot & Bo asked me to guest post on their blog! I was super excited they reached out because, seriously, I love them. Check out my post on the Dot & Bo blog here! Have you seen Joss and Main? It’s similar to Dot & Bo, but the collections are organized a bit differently. Like Dot & Bo, you essentially can find super awesome stuff for your house at great prices. We recently ordered a rug from Joss and Main (which I instagrammed a few weeks ago). The rug is GORGEOUS, but apparently not very resilient. We had an issue on the second day with some spilled water. Yes, just plain old water. Joss and Main’s customer service replied immediately and rectified the situation, going WAY above and beyond what I ever would have expected them to do. So, there you go. Really cute stuff, great customer service. Thought I should spread the word! Your turn! Share whatever you want! All of the kale talk this week inspired me to throw up a post on Huffington Post about kale chips. When I shared the link on my personal FB page, it generated quite the discussion. It was kind of awesome. Also, more people hate kale chips than love them, so that makes me feel sufficiently vindicated. One more also, a friend mentioned that Jim Gaffigan also has strong feelings about kale. Basically, all of this makes me happy. 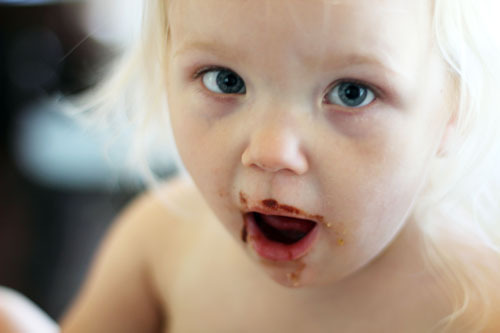 And a fun post on Babble that my girls helped me write! 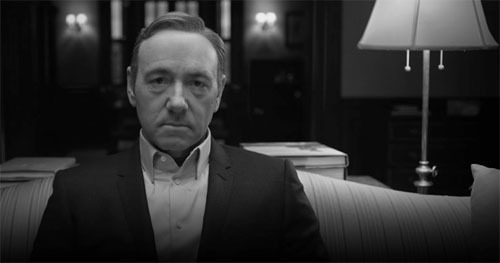 Before we get to food, can we talk about House of Cards for just one second? Nate and I FINALLY watched the Season 2 premiere this week. And this is what I have to say: WHAT?!?!?!? SERIOUSLY!?!?!? Totally did NOT see that coming!!!!!! Obviously I am not going to spell it out because President Obama asked for no spoilers, but for real, crazyTOWN. Nate and I need to get going on the rest of the season to see what Frank’s got in store for Washington, D.C. My friend Kathy posted a status on Facebook the other day that she was watching a little of The West Wing on Netflix to counteract House of Cards. Made me laugh because it’s so true. They’re basically the same show except one is the angel on your right shoulder and the other is the devil on your left. I’m just hoping reality reflects The West Wing!! Here are my “Babbles” for the week! 15 Non-Lemonade Lemonade Recipes to Gear Up for Spring! Show and tell means everyone in the class gets to share, so be sure to share your stuff, whatever it is! 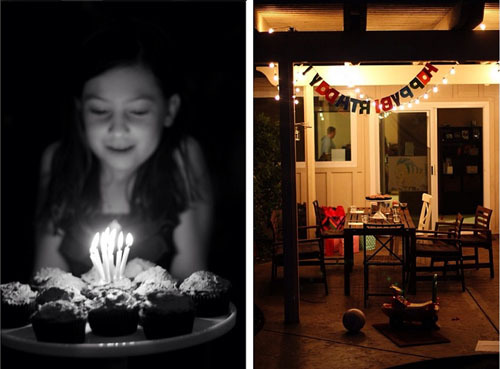 My cousin is visiting with her family and we celebrated their daughter Emma’s birthday on our back porch last night. I can’t tell you how grateful I am for that porch. We’ve only been in our home for 9 months and already have so many wonderful memories on that patio. I’m feeling very grateful this morning. Show and tell is for the whole class, so share whatever you like! Happy Friday!